Have you seen infomercials for those rolling round brushes on television? I have, and I paid little attention. They looked like a quick way to get my hair massively tangled . 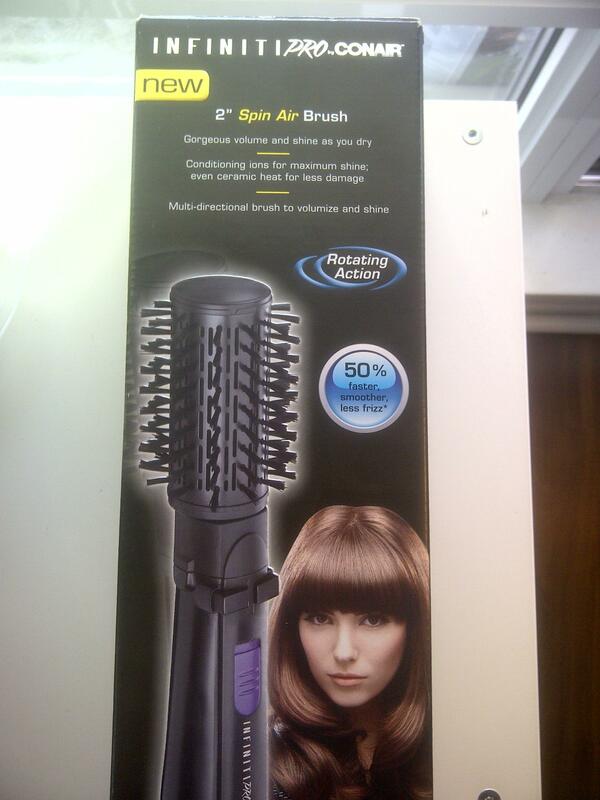 So, when I saw the Infiniti Spin Air Rotating Styler by Conair at Rexall , I didn’t pay it much attention. Then I saw the price tag. The brush was on clearance from $59 down to…$14. Holy moly. Still skeptical, I picked one up. The beauty of blogging is that no product is a waste. Products , both good and bad can be reviewed and even if the product is not a good fit for me, it can be reviewed and hopefully provide some helpful information for TNL readers. I am in awe of people who are able to round brush their own hair. Am I the only person who finds this to be an impossible feat? I am certain that I would need a minimum of three hands to accomplish this successfully. Because I am so very blowdryer inept, I usually just blowdry or air dry my hair without a round brush and then flat iron it. However, I much prefer the body that comes with roundbrushing hair with a blowdryer. Alas, I have to rely on my hair dresser for that. So, in theory a round brush with the blow dryer inside should be perfect for me. I was actually impressed with my results the first time that I attempted to dry and straighten my hair using the rotating styler. It was quick and pretty foolproof. 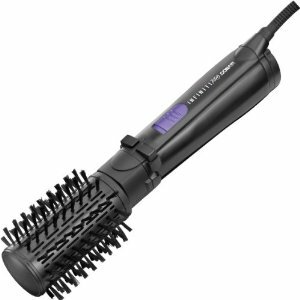 The first time I used the Rotating styler, I used it when my hair was only towel dried. I have since learned that if I let my hair air dry a bit before using the styler it takes less time. I separated my hair in the small sections and places the styler underneath. I pressed the button to allow the styler the turn away from my head, thus pulling my hair taught and straight as it dried. Not half bad, no? Please try to ignore the fact that I am about 7 shades too light in this picture. Focus on the hair. So the results were pretty good, and definitely left me with more body than just a flat iron would. However, it definitely does not get my hair as straight at the root. This makes it more prone to frizz and puffyness. I have since used the Rotating Styler a number of times and I have learned that the key is to work in small sections that are no wider than the brush. If you pull a section of hair that is too large, it will get caught on the edges of the brush and the result is a cross between a tangle and a dreadlock. Towel and air dry hair a bit first if possible. The Rotating Styler takes a long time if hair is very wet. You will have to pass over the same sections of hair many times before it is finally dry and styled. So, if you can make sure hair is about 60% dry before beginning, styling time will be quicker. The brush has an arrow button to control the direction it will rotate in. 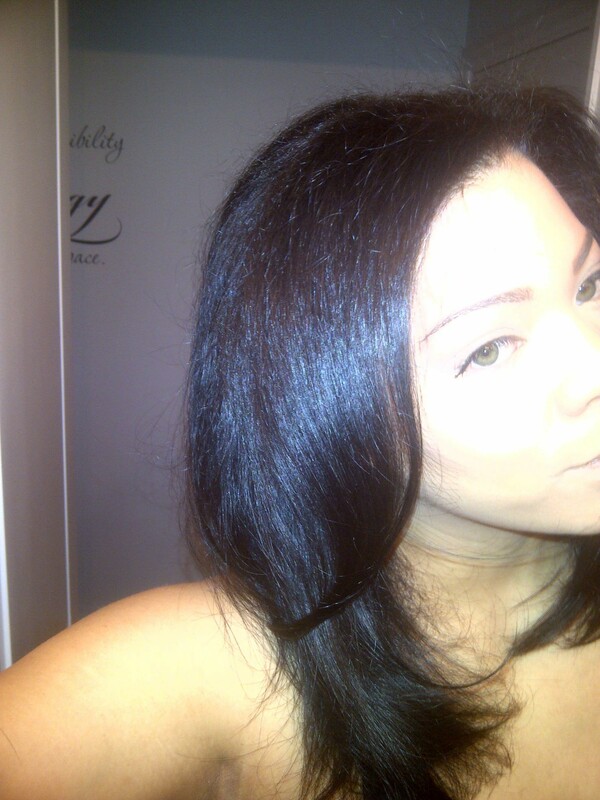 I always position the brush underneath my section of hair and then direct it away from my head, pulling hair straight. I suppose you could put the brush on top and direct it towards your head to flip ends up, but I haven’t attempted it. Although the results are good, it does not pull my hair straight from the root. For this reason, it puffs up and frizzes a lot more easily. So, I don’t think I will be reaching for this brush as the weather gets warmer. The Infiniti Spin Air Rotating Styler is a good product, better than I expected. It can be used to refresh and add body to my hair, but as a straightening alternative, it just won’t cut it. I think this would be an excellent product for those who may have naturally straight hair that is not prone to frizz. Have you tried the The Infiniti Spin Air Rotating Styler? Griffin Centre – Everbody Counts. “Please try to ignore the fact that I am about 7 shades too light in these pictures. Focus on the hair.” LOL it’s like you knew I’d say something. I like the body it gives your hair, but you’re right – the frizz in the warm months not kosher. great review Ash… I too am always on the hunt for a tool like this as I can’t blow dry my hair… I have tried the Conair one but it doesn’t spin… which is ok… but yes perhaps I should try this one too… what a great pricepoint! I seriously do not understand how anyone can effectively blow dry their own hair with a round brush. Crazy. Me too, I don’t know how people do their own round-brush styling. When I try it at home, I start with the underneath layers of my hair and by the time I get to the top layers (the layers that everyone sees) my arms are so tired! I cheat sometimes and just concentrate my energy on the top layers that I want to look nice, then just run a flatiron over all of it. I know that you said the Infiniti Styler is not good at straightening from the roots, but if I may say – that pic was va-va-voom gorgeous! Your hair looks so soft and pretty. You could always use it in the winter months on days when you are wearing a beret or other hat so the roots won’t matter! Thanks Seph! Great tip about the hat. They are always perfect for those not-so-perfect hair days!! Thanks so much for reading! Humidity and my hair are enemies too. There is nothing worse than painstakingly flat ironing your hair only to have it turn into a puffball as soon as you step outside. If you try the bruch please let me know what you think!